I thought this was meant to have been fixed? anyone else seeing them in platoons? Your current Kozispoon, RyDiggs here. Us too. Come on, man, how is this still a thing that happens? Same here! On September 20th they said this wouldn't happen again! Yep same here. This goes against their updated language for the newest fix. "Platoon Missions should also no longer require specific units that are required in a Combat Mission or Special Mission inside the same phase of the Territory Battle." This is litteraly their job. I think if you messed up at work like this your customers would 'harass' you as well..
so this still doesnt work. i already gave good feedback, looks like i have to change it again. Exactly. They always leave themselves an out. Imagine that. So honest and straightforward. Yeah right! Agreed. It was officially announced it was fixed. It does not come across very professional when it's stated something is fixed, only to find out it is not. Got it in our one as well, at least we're not alone I guess. Come on CG. WTK? Get your act together. This bug was specifically said to have been addressed. 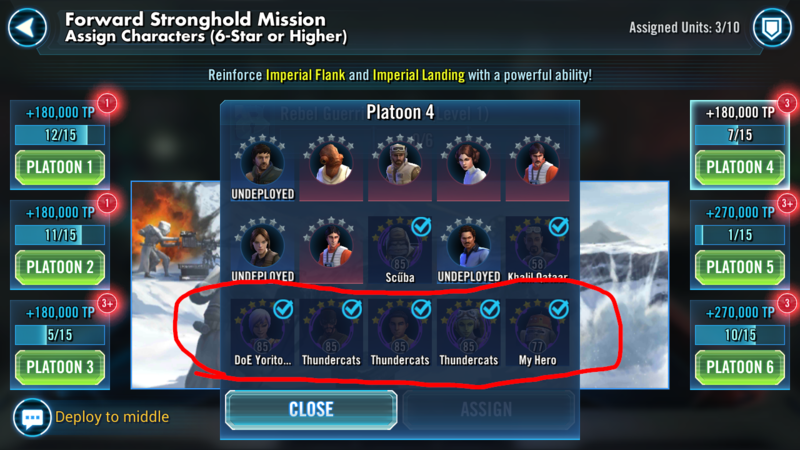 So many lightside u can choose other than Phoenix and it just had to put them there, and freaking new Ewok, when will they fix platoon, is it gonna be another **** teebo? How were they to know that this bug would happen? How are they supposed to fix something they don't know is broken? That is what we do for them, we report bugs and they do their best to fix them as fast as they can. We should not be a bunch of kids to them when something is so blatantly a glitch, being in the exact same territory the same platoon and even all on the bottom row. That's the same row that's always been there for everybody. It must have been programmed like that - how else could that happen? And, why does it being a bug mean we shouldn't criticize them? Especially a "bug" that they specifically said was fixed? If not customers, I am pretty sure your boss would. It is these little things that add up to when something like 20k in crystals is randomly dropped that makes people explode on here. Because is it a constant string of issues. One after another that they game shouldn't have this far in its beta stage. Since we are the beta for it or it appears. TBF, those weren’t randomly dropped. They rewarded those who spent money over a few day period for TB Han. I am not even sure I can reply to this? They said it is fixed so they obviously were supposed to test it. Next time you get your car fixed and the mechanic calls you to pick up your car, please let me know what you tell him when it doesnt start in front of him. Let's give them some time to comment. Maybe it was a mistake or some misunderstanding. However I would recommend to the moderators NOT to Mega Thread this thread. So it will stand out for a comment. If that's not too much to ask. We may have been reading it incorrectly. It is a different section for most people than the Phoenix one. And IIRC that was the exact post. Same phase same section this is same phase different section.